A year ago, I logged into the website for our local supermarket and shopped online. I was getting ready for a big holiday meal and was grading papers, so I was desperately looking for way to ways to save time. It was an alright experience. I did save about a half hour of time. I didn't get distracted by other items in the store and kept to the shopping list more strictly. I didn't have to deal with old people clogging up the lanes. I haven't shopped online ince then. I like picking out my own produce. I like browsing the meat section. I like poking the cheeses. Also, online shopping is for people who only food shop every week or so and stick to one store. That's not how I shop. Instead of one big shopping trip a week, I usually do five smaller trips. I tend to decide on the dinner menu around 3:00 every day, because I'm not very organized. I go to three or four different markets for different things. I like to go to Trader Joe's for cheese and hummus, Kings for the fish, and Shop Rite for canned goods. 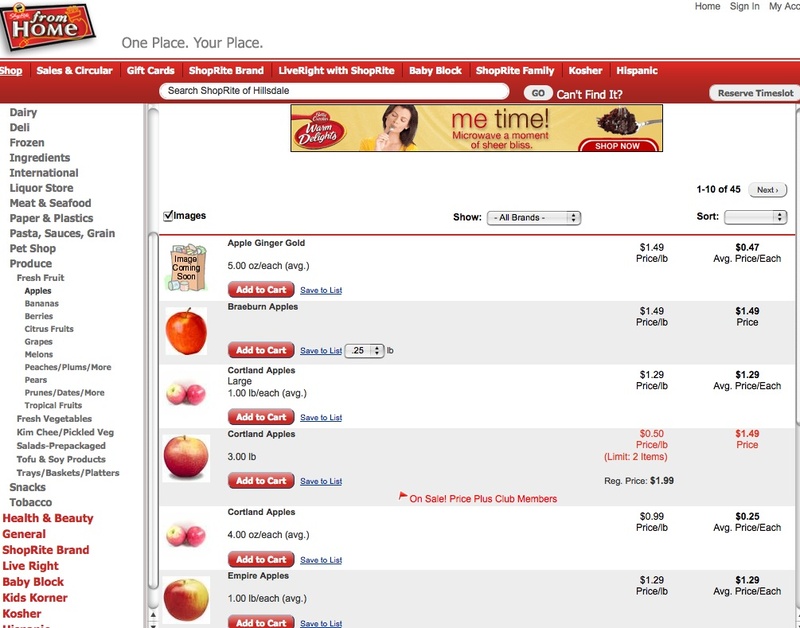 Mark Bittman wonders if online shopping could enable people to make better food choices. He isn't all that thrilled with online shopping either, but he envisions a system that would allow for more consumer selectivity. or those Cheez-Its you have trouble resisting. Even with these options, I'm still not sold on online shopping. Most people wouldn't bother to use those advanced Bittman preferences. It also takes people one step further away from the food. Inspected a bin of lettuces and finding the best head is an important part of the food experience. I don't care if I get Romaine, Green Leaf, or Bibb lettuce. I just want to get the freshest variety I can. I need to be in the store to make that determination. The only downside to all this food shopping is that I often have to bring my kids along with me. That means that blueberry waffles and Crush Cups end up in the cart, along with the fresh Bibb lettuce. On the hand, I have started to train them. They now know where everything is. We go into the store and I send them off in separate directions for the various items. "Jonah, go get the apple juice. Ian, we need bread." They scamper off like Border Collies with big grins on their faces. They think it's a treasure hunt or something. I too was somewhat put off by shopping online. Yet in Providence I was without transportation and Whole Foods is quite expensive for everyday shopping. A friend recommended online shopping (Shop and Stop or is it Shop and Save?) and she said, “Online food shopping MUST provide you with the FRESHEST produce, veggies, etc. otherwise you will not shop online in the future.” So I took a chance and shopped online. She was correct. The produce was of the highest quality. I highly recommend shopping online. And, I agree that I probably purchased less junk food. In NYC we don’t drive so of course our carbon footprint isn’t as much of a concern. And, I so wish that we could shop online for Trader Joes (TJs). We know their products by heart and love them. Our main shopping is done via TJ and then we supplement through the local organic store (super expensive) or the corner bodega. Don’t forget that the American Association of Pediatrics recommends online shopping for mothers of small children because shopping carts lead to too many serious injuries. Seriously. I enjoy grocery shopping too much to give it up, though, so my girls will just have to take their chances. I like to shop onliningly? heh, Ragtime. I made some edits. Online shopping sounds just fine to my ear though. “I’m doing some online shopping. Online shopping is easy.” “I online shopped,” is rather clunky. Marya, I thought you were kidding about the AAP. What wimps! So, while you leave your child with a friend to go grocery shopping, the kids decide to see if he can balance on the friend’s handlebars while going downhill. Or, as you shop online, you never leave the house. Your child gets too fat to pass through the doors. You can’t let him outside, because it’s too *dangerous* out there. I’ve tried online shopping. I don’t like committing myself to being home for a 3-4 hour stretch. I also found that they frequently ran out of fresh fish or meat. The produce wasn’t wonderful. When it was free I tried it out, but it wasn’t worth the $5 charge. I prefer to plan several days’ meals the night before, and shop on the way home from other errands. I loved FreshDIrect when I was in the city. It made it so much easier. OUt here, however, I haven’t used the online shopping option. In large part because I don’t get that much stuff from Shoprite and Trader Joe’s doesn’t do delivery….yet. Marya, I did indeed stop going to the grocery store when my boys were small because of the shopping cart injuries. Too many little old ladies were getting smashed in the ankles by a kid-sized shopping cart driven by a speeding 3 year old. Loved the online experience until the company went out of business. You might feel differently if you had FreshDirect.